Need to speak Greek? Learn some basic words to get you started and find out where to get free Greek lessons online. Although southern Cyprus is Greek speaking, if you already know a little Greek, you may not understand a lot of what the locals say. That is because the Cypriots speak a dialect form of the language called Kypriaki, which even fluent Greek speakers often find difficult to comprehend! It does make it much harder to speak Greek if you are trying to learn from scratch, but if you persevere and are not afraid to make mistakes when speaking, you CAN learn. Just don't expect to make yourself understood in some of the more remote villages where the dialect there is often completely different from anywhere else! 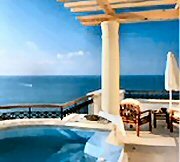 When I arrived on the island almost 8 years ago, I spent the first 6 months with my head in a Teach Yourself Greek Book and learned the basics to get by. Ok I have a language degree in French and German, so it was easier for me to pick up and actually speak Greek, but you can get by in any language if you learn a few basic words and a dozen or so verbs and are not afraid to give it a go. Here are some key words in CYPRIOT Greek to get you started. I've used an English "transliteration" system for the Greek to show you what the word SOUNDS like rather than show you the word in Greek, which is impossible to read unless you know the Greek alphabet! Tip: Try to say the words out loud to yourself to help make them stick in your mind. I know you think you will sound stupid, but it really does help! In written Greek, there is an accent above a letter to tell you where to put the stress in the word - that means where you emphasise one syllable versus another. Tee-kam-nees - How are you? Pos-oh kah-nee - How much is this? If you learn the basics quickly, you may want to take things further and start learning a bit more. One essential little book to get you started is the fabulous Be Happy & Speak a Little Greek! by David Patching and Nikolas Georgiou, which is available at all good book shops and stationers on the island. You can also buy it on Amazon, though it's sometimes out of print. 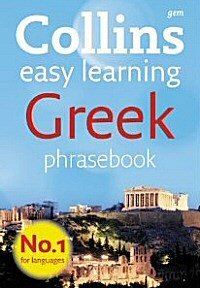 It teaches you the Kypriaki dialect form of Greek, which believe me is essential if you want to chat to the locals in the coffee shops. And if you like to learn the audio way, why not try some FREE Greek lessons with easy to use 15 minute sessions you can listen to at your leisure? I still use my Teach Yourself Greek Book which came with 2 CD's, so you hear the language as it should be spoken. My dog-eared copy is pretty battered now as it has to be 10 years old and while you can still buy it on Amazon, either with or without the CD's, the course has been superceded by the Get Started in Greek: Teach Yourself (Book/CD Pack) which focusses even more on teaching "absolute beginners." I flicked through the course that a friend, recently moved to the island, had bought and it's a great improvement on my old teach Yourself Greek book. Plus the CD's really do teach you to pronounce words properly. My friend is already ordering food in Greek at the local taverna! Building terms - essential if you are having a house built like we did!